From Horse Power to Horsepower show the triumph of farming pioneers to lighten the load and ease the burdens of farming. There were many dramatic steps toward more sophisticated mechanical systems, involving steam, gasoline and diesel power. The farming pioneers in the McFarland area and around the country were inventive, adventuresome, varied and practical. Their efforts gradually eliminated the dependence on horses. 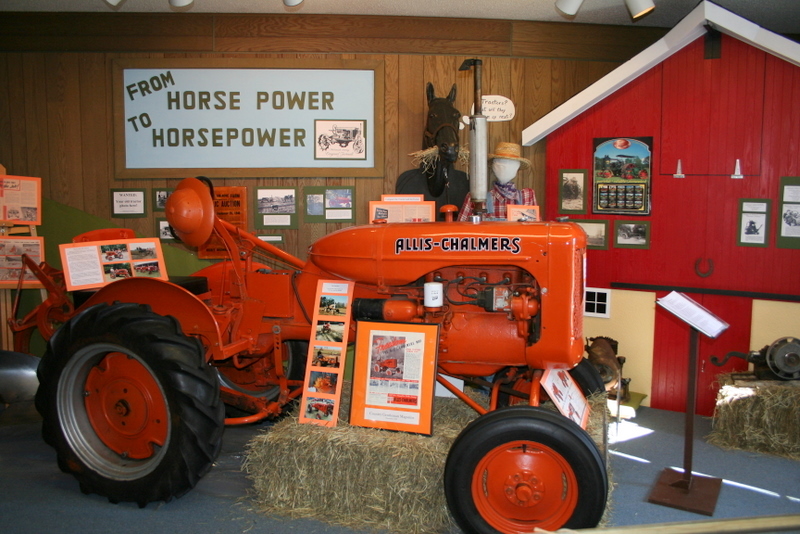 Replacement of horse power began with early steam engines showing what mechanical power could do on a farm. Next, the development of the internal combustion engine gradually made inroads during the early 1900’s and signaled the beginning of the end for animal power. 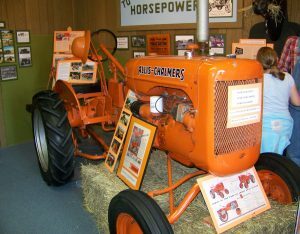 Beginning in the 1920’s, farm tractors rapidly became popular – at one time 186 firms were producing a bewildering variety of tractor models in the United States. The development of small gasoline-powered engines for use on the farm also removed much of the toil and burden of hand labor for many jobs. Portable engines with belts and pulleys were handy for pumping water, grinding feed, separating milk, churning butter, running elevators, powering washing machines – the list goes on. Two other important developments were rapidly being adopted by the early 20th century farmers to make life easier. Along with the tractors came the advent of the horseless carriage. The automobile wa s a better way to move people and do hauling and pulling tasks. The automobile also brought an end to rural isolation, increasing the closeness between farm and city life. Lastly, the arrival of electricity on the farm greatly reduced the need for human and animal labor. More versatile than gasoline, electrical energy created many possibilities for advancing farming changes. With small engines, tractors, automobiles and electricity – even the “good old days of farming” were becoming less a burden, more an attractive occupation.